As of September, 2016, StudySpanish.com changed its IP address when it released a new version of the site. For this reason, some users will find that emails from the website are now blocked or untrusted by their email provide. If you are experiencing this problem, follow the instructions below that apply to you. If you are not receiving our emails, you should check your junk and spam email folders to see if they are mistakenly being moved to those folders by your email provider. If you find the email there, your email client should provide you a way to select them and identify them as ‘not junk’ or ‘not spam’. Most email providers will give you a way to specify email addresses that you want to ensure you can receive email from. Generally, all that you need to do is to add the email address, info@studyspanish.com, as a contact in your email client. Below are instructions on how to do this for a few common email clients. 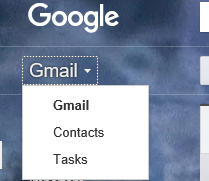 Select Contacts from the menu drop down found on the Gmail menu at the top left (see screenshot). Within the Contacts page, create a new contact. Click the address book icon under the Yahoo! Mail logo. When you roll your mouse over it, it will say ‘Contacts’. If you are using a school or university provided email, then you should also first attempt to add info@studyspanish.com to your email contacts list. You should also check your junk/spam folder to confirm if the emails are arriving in those folders. If you still do not see our emails, there is a possibility that your school or university is blocking our emails before they can arrive at your inbox. You should reach out to the IT Support group for the school/university to inquire if this might be the problem, and if they can help configure the system to allow our emails in.